Tyler Sage was raised in Colorado, and currently lives and teaches in Baltimore. 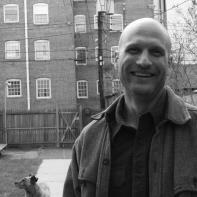 Among other places, his work has appeared in Story Quarterly, PANK, and The Portland Review. On the side of the street there is a man who sells melons out of the back of his pickup truck. This is on the last leg of my drive home from work, after I've come all the way around the beltway and taken the exit back into the city. The exit ramp crosses over the beltway on a high bridge; at the end of this bridge there is a soundwall, upon which have been painted ten foot high, long green alligators. These alligators lead to a stop light, and just past the light, on the left, is the place where the man parks his truck at the curb. The open back is piled with fruit. Beyond him is a neighborhood that is a bit tougher than ours, and then comes our neighborhood. I pass him every day. Melons, he is usually selling, although I've seen him with whole truckloads of other fruit, and in the fall with unshucked ears of corn. He has a lawn chair with an umbrella fixed over it. He sits and watches the traffic pass. Sometimes he stands with the forearms on the rim of the bed of his truck, looking out over his produce. There is something reassuring in his form. Maybe it is his placidity, the way he stands. Maybe it is because his produce always looks fresh and healthy. Seeing him means that the long hectic drive, with the traffic of the beltway and mad stop and start of the city, is almost done. The other day I finally stopped to buy a watermelon from him. It was a day in which I'd had to inform two students, one of whom I liked very much, that because they had plagiarized their papers they were going to fail my class. It was also a day in which I was apprehensive about getting home because my wife would be there already, and I could feel that the feuding that comes over us sometimes was going to start as soon as I hit the door. I drove, thinking about these things, and then I saw him and decided on the spur of the moment to stop. I parked and he struggled up out of the chair to meet me. He told me that the melons were good and flavorful and that they came from a farm in southern Pennsylvania. He explained to me that the best way to tell a good melon is by its weight, because heaviness means that it's carrying a lot of juice and has not dried out. We picked a melon for me. I lingered and he seemed to like to talk; we went first to the weather, which has been hot and strangely stormy, and then to the local baseball team, which is mired in a losing streak of a decade's length but showing signs of being a contender this year. I stood with my melon held in front of me like a pregnant woman's belly. After a while I asked him how he'd gotten started selling fruit, and he told me his story. I'm a Southerner, he said. Come up from Georgia. He smiled. Come up after a girl. She was from a good family, and she was up here to go to college. I didn't have much in the way of a family myself, and so after she'd been gone for a while I got in my truck—a different one than this truck, you know, but not so much different—and followed her. The man had taken up his position leaning against the side of the truck. His arms were crossed on the metal and as he spoke one of his hands rested on a melon. I stood next to him, leaning with my back against the metal, and I got the feeling that you sometimes get when you hear someone begin to explore again something they've spoken of many times, thought about many times, some hard and persistent knot in their life. Three things happened when I came up here, he said, and they're the only things you got to know about to know about me. Most men can't give you their life in three things, but I can. The first thing was that that truck of mine got stolen. I parked it on a side street next to her campus and I went walking to find her. I didn't know if I was allowed to just go walking onto the campus, but I did. You know what it's like, seeing that for the first time when you've never seen anything like that before? The paths and those big lawns and the trees, and those buildings? Goddamn. Now it's nothing, but for me back then? And my girl, I couldn't believe that this was where she was at, but then I suddenly knew how right it was. She was smart, but not in the way that a lot of people are, with facts and figures; no, she was smart in a way where she just saw everything exactly clearly. When she looked at you, it wasn't like she was just looking at you, it was almost like she could see all the things you've ever done and all the things you've ever thought. She wasn't judging you or nothing, but just trying to understand what all those things must have felt like. Maybe that's making too much of it, but that's how it seemed to me. It gave her this real sad-like way of looking. She knew who everyone really was, teachers, parents, her friends, everyone. We'd known each other since the ninth grade. We met because I was in a fight and lost and she stepped in to tell the guy that enough was enough. Skinny little girl standing over me, I can remember it now. That's how we met, and we'd been going together, kind of off and on, ever since. So I came up here to look for her. I had an address she'd given me a couple of months before; I'd gotten her number from her folks and called her up late and asked her where I could send her a letter. For a while I just wandered around the campus staring at everything, and then I stopped to ask someone about this address. They didn't know nothing about it, and the next person didn't either, and it didn't take me too long to figure out that that address didn't exist. It was getting to dusk now and I went back to where I parked my truck. At first I thought I was on the wrong street, because my truck wasn't there. So I walked around on the other streets, and I realized my truck wasn't anywhere. I didn't have nothing. A few dollars in my pocket, that was it. I filed a report with the cops and they said they might find it. Sometime. So I slept out of doors that night. In that park right down from campus. You know the one. I was scared as hell so I stayed awake as long as I could, scared to death that someone was going to sneak up behind me and beat me on the head with something, and then I finally couldn't make it any longer and I fell asleep. And here's the first thing you have to know about me: I lost all my fear on that night that my truck got stolen. All of it. I was a young kid and my truck was gone and I was on foot in a city I didn't know, a million miles from the town where I'd grown up at. The girl I loved had just broken my heart, and I was realizing that she'd actually broken it months before, when she'd given me that fake address, but I hadn't known that until now. I was afraid of cities, and yet here I was. Without a truck there's no way to escape. You aren't anything because you can't move. You don't have the freedom to go nowhere. But I learned something. What I learned was that once you step into your fear, right up into it so that it's all around you, then it loses all its power over you. It becomes just something like an itch; sure, you may want to scratch it, but you can also look at it with contempt, and wait, and it will go away. He looked over at me. He reached his hand up off the melon to cup his chin for a moment, squeezing gently like he was testing for ripeness, and then dropping it again. You had enough yet? he asked. You still with me? I told him I was. He nodded. So the second thing you got to know about me, he said, is that my dog died. I know it sounds terrible, like I'm in one of those old blues songs or something, you know, my woman left me and my dog done died, but it's the second thing you got to know about me. I loved that dog. After I lost my truck I scuffled around in the city for a while, and I did some things that I'm not so proud of, and finally I started working down around the harbor. There's a market down there, or there used to be, that was a wholesale produce market for the city. For the restaurants and some of the supermarkets and whatall, produce coming in from trucks and ships and then getting bought up by the buyers. I got a job just loading and unloading, working with the longshoremen. And I picked up a little apartment, just one room, and I picked up this dog. He used to come everywhere with me. He'd walk down to the harbor in the mornings with me, and there was this shady alley where he'd sleep all day and I'd take my breaks and go take him something to chew on, a little piece of fish if I could get one, sometimes just a couple of carrots, because one of the unique things about this dog was that he loved carrots. It was early morning work, so I'd take my ten minutes or whatever and sit there in the alley with him and it would be dawn and he'd chew on his carrot and I'd watch the whole market going at it, fish guys and vegetable guys, buyers from all the restaurants and markets, trucks going past, everyone yelling and happy because it was busy and we were all making money. And in the afternoons I'd walk around with that dog and see the city, walk around my neighborhood and watch people, see what their lives were like, and that dog was with me the whole time. Now this one morning I was sitting there, taking my break and smoking a cigarette, looking over at these guys who were arguing over a big shipment of papayas. You know papayas? It's a beautiful fruit. I was sitting there looking at them and they seemed so beautiful and exotic, like they'd come from a some land of paradise. I'd never eaten a papaya in my life before I came up to this city, but now we were always getting bruised stuff and half-spoiled stuff, and I was sitting there thinking about how big the world was and how little I knew about it, you know, if there was this whole beautiful fruit, just a fruit, that I hadn't known anything about before, and now I knew about it and loved eating it, then how many other things out there like that were there? Things that were more important than a piece of fruit. All out there waiting to be found. And I looked over at the dog, because sometimes when you have a feeling like this it makes you want to check in on the things you love, almost like you can share it with them, you know what I mean. So I looked over, and I remember this clear as day, I looked over and that dog was lying there real still. Stiff. Looking right at me, still looking right at me the way a dog does. And I knew. It happened for no reason that I could ever understand. It was just his time, or however they say it. He was just alive and then his time was up and he was dead, but he was looking right up at me. I'm not ashamed to tell you that I wept. Right there. I sat there and I cried like a baby. And those men they just went right on arguing about those papayas. And looking back, and, well, I know that the way our memories work sometimes isn't like the way it happened at the time, and I know I'm probably compressing a whole month or year of my life into one moment, but I look back and I see how I hadn't understood until that moment how lonely I was. Living alone. Working with men that I never tried to get to know. Taking my breaks sitting in an alley. Just that dog for company. When he died, and maybe this sounds crazy, but I'd had a pretty hard go of things, you got to remember that, when he died it was like I was learning the most important thing I'd ever learned. Like I was being pushed out into the world all on my own. I was naked and alone and I couldn't let anyone see it, of course, but I understood how big the world is that's set up against us. The size of the things we're facing. I hadn't been much of a good person before that. You probably guessed that. It wasn't a mistake that the girl I followed up from my town hadn't wanted to give me her address. I'd done bad things, and I'd done worse things, that I don't even talk about no more. But that dead dog. Goddamn. Faithful as hell and then dying like that, just staring up at me. I learned about loneliness. Just like that. Like lightning, or like a huge waterfall coming though me. I feel like I wept all of it out of me. I can still smell that alley if I close my eyes, and smell the air coming in off the salt water, smell the diesel smell and feel the coolness of the shadow. He opened his eyes. We came back to the street and the truck full of melons and the heat. He was quiet for a while as a wave of cars passed and then he looked over. What's the third thing? I asked him. He smiled. Birth of my daughter, he said. You thought I was going to give you another blues song thing, didn't you. The time the devil showed up to call me out, or the time my wife left me or something. I don't know what I expected, I said. He laughed. Birth of my daughter. I don't need to go into all of it about her mother. It was just one of those things. It was good and then it was bad. And right about the time it started to go bad was when my daughter was born. Astra. It's a beautiful name, isn't it? I got that much right, at least. It was my name. I mean I came up with it. Astra May. And when she was born, this is the hardest thing to explain, but I kind of felt like I'd finally been set free. Not from her, or from my life or even from her mother, even though we didn't last much longer after that, but from myself. It was like I'd been set free from myself. Like now I could leave myself behind and help her, this little baby, help her get ahead and have her own life that could be something beautiful. I was finally free from myself because she had herself. I had that feeling, I remember looking down at her in the hospital and having that feeling. And it was true. It was true. It wasn't always easy, but I helped her through. All the way through. She's grown now, and she's in college. You believe that? And you know it's the same college that I came up here and wandered around on that day. You know it is. She's in college and she's a good woman. Smart and a good person and she's probably going to be a doctor. And she set me free. I can sit here all day long and not mind anything, sit here and watch the cars go by and talk to my customers. I don't need much money to get by and I'm free as a bird. So those are my three things. I lost my fear. I learned my loneliness. And then my daughter set me free from myself. And now I'm just the melon man, selling the best fruit in the city. He took his hand off of the melon and turned to regard me. Sitting here watching us all go by, I said. He watched me and I watched him. A long moment passed. A smile began to play at the edges of his face. You believe me, don't you, he said. The punctuation is difficult here, because he said it halfway between a statement, as if he were slightly incredulous about the fact that I might have believed him, and a question, as if hoping that I did believe him. You believe me, don't you. I shifted my melon over to my other hand. I didn't know exactly what I was feeling. He laughter faded and he looked down at his hands. That's not real, he said quietly. His voice was sad, a little chagrinned and a little self-loathing. None of that's real, he said. I'm from Detroit. I did time in Illinois for assault and battery and for stealing cars, and I did time here for transporting stolen goods. I got three kids that I haven't seen in ten or fifteen years, and the only reason I even have this truck is that my brother loaned me the money for it the last time I got out. He's in the transport business and he got me hooked up with the farms where I get this stuff. I sell it for them. They're about fifteen minutes outside the city, not in Pennsylvania at all. They pay me eight bucks an hour and gas. He's done a lot of things for me, my brother, I mean, but he doesn't like having me around. So I don't go around. Can't say I blame him. I'm a felon and a liar and I already know that sometime, you know, maybe next year, maybe in five years, something's going to come along that's no damn good at all, but something that I can't resist doing. And I'm going to do it. I know it's going to be terrible and stupid and I'm going do it and flush all this down the drain. He motioned at the truck and the melons and the street. That's who I am, he said. I got no three things about my life. That's just a story I like to tell sometimes. I'm a felon and a liar, but at least I can be honest about it. Sometimes, at least, I can. The traffic rushed past and overhead a helicopter fluttered through the sky. We looked at each other again. And was this story about himself true? Was it any truer than that other one he'd told me? Of course not. It's not true because I've never stopped to talk to this man. I've never pulled out of the stream of traffic and dug the bills out of my wallet and gone to buy a piece of fruit. I've never spoken to him, nor has he ever distinguished me from the thousands of people in the thousands of cars that pass him every day. But I can tell you this: I'm often lonely myself. I too often dream of other lives, and of distilled moments in which I understood things. I see the faces of people like him, leaning on his truck and watching all of us blankly, sitting there day after day, and I believe I see what's going on behind those faces, and for a moment I feel better and the loneliness fades a bit. But I've never actually stopped to talk to him.